Potato leafhoppers are starting to injure alfalfa in many areas. Scouting for these insects and protecting your alfalfa from injury may be needed in your fields. Potato leafhoppers are tiny, yellowish-green, wedge-shaped insects. They blow into our region from the southeast from late spring through mid-summer. 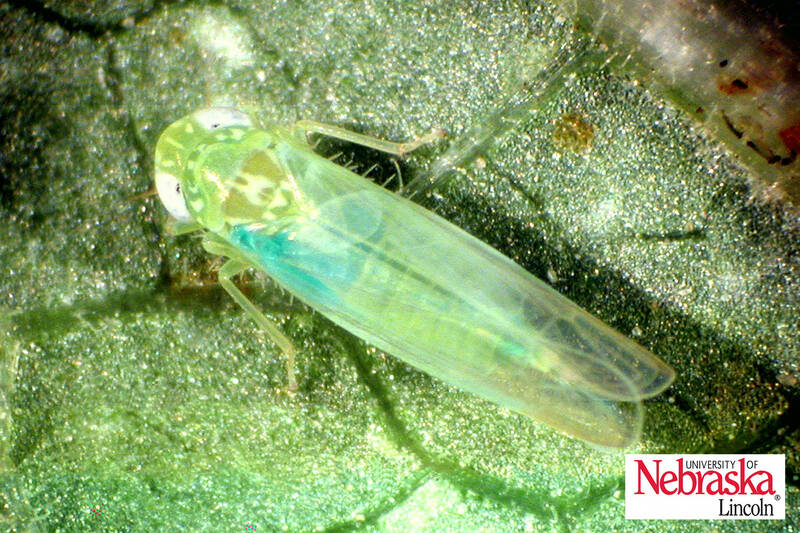 Leafhoppers turn alfalfa yellow and stunt growth, and they especially hurt new seedlings. Check fields at least weekly for leafhoppers before symptoms appear. Don't wait! If you detect leafhoppers early and they are present at threshold levels, insecticides can kill them easily. Continue to scout for leafhoppers after treatment since leafhoppers can migrate from other fields and reinfect your sprayed field. However, if your alfalfa already is yellow and stunted, do not spray. Instead, first mow your alfalfa to remove affected plant tissue and to stimulate new growth. Unmown plants might not grow much more all year, lowering yield and potentially leading to stand loss over winter. After mowing fields, scout new regrowth at least weekly for leafhoppers. If they reappear, then use insecticides if threshold levels are present. Treatment decisions are based on numbers captured by a sweep net. (A sweep net is the only reliable way to scout for potato leafhoppers.) See Tables 1-3 for decision-making help. Note that there do not have to be many to cause a problem. Many insecticides are registered for control, and all will provide good results when applied properly. Commonly used insecticides include Mustang, Warrior, Baythroid, and Lorsban or products with the same active ingredients.